I want to make an observation that I have found while researching. I have been reading these original letters on microfilm, and then I have been finding the printed copies of the same letters in the congressional reports. The difference is that in the congressional reports, they do not include the complete copy of the original letters. And I think that sometimes, there is a crucial difference because of the omissions. For example: In the previous letter from February 1817 by Archibald Clark about the death of Mrs. Garrett, he ends with a request for more troops, and mentions how the settlers have been adventuring into the Indian Country and driving away the Indian cattle, and that was not mentioned in the Congressional report. That certainly puts the biased into the report and makes it look like the Indian is the aggressor without provocation. In reality, the Indians were raiding the settlement because of the raids and aggression by the Georgians, which was completely omitted from the copy of Clark’s letter in the Congressional report. Letters were printed in the congressional report from Alexander Arbuthnot mentioning the Georgians raiding the Indians, but Arbuthnot was looked upon as a British instigator with no sympathy. In another example I found, General Gaines in the second half of a letter, describes all the land in Florida that is suitable for settling and farming, and that is missing when his letter is published in the congressional report. It was obvious that General Gaines was looking towards land speculation in Florida as soon as it would be taken from Spain. In this letter written by General Gaines a year before Jackson arrives in Florida, Gaines seeks permission to go down to Florida to destroy the Seminole’s towns. His justification is the death of Mrs. Garrett the previous February. There is also mention of Alexander Arbuthnot, who is an advocate speaking on behalf of the Seminoles, who Gaines speaks with disdain. The 70-year old British trader will later be hanged by Jackson. Arbuthnot wanted the United States to honor its obligation to the Native American Indian Tribes as outlined in the Treaty of Ghent that ended the War of 1812. Jackson and Gaines considered that superseded by the Treaty of Fort Jackson in 1814. In fact, it can be argued that the following letter got the ball rolling, and causeed the First Seminole War, where Gaines writes that he wants to “Destroy their habitations,” and, that he will “write to Major General Jackson upon this subject.” Jackson was overall military commander, and Gaines was subordinate to him. So this is the exactly the action that Jackson took with the blessing of the Secretary of War one year later. It was no secret what was going on. Later, the Sec. of War would tell Gaines to do what he needed, which includes crossing over into Spanish territory. Here is a transcription of this provocative letter: From the Adjutant General letters received, G64 1817. I received by the last mail a letter from Archibald Clark Esquire, Intendant of the town of St. Mary’s, by which it appears that another outrage of uncommon cruelty, has recently been perpetuated by a party of Indians upon the southern frontier, near the boundary of Wayne county-- They have massacred a woman / Mrs. Garrett and two of her children—the mother and eldest child were scalped—the house plundered and burnt. / The high respectability of the Intendant leaves no ground to hope that the report of this afflictive catastrophe may remain at all questionable. I have ordered a company of Artillery to Fort Scott, and have desired Major McIntosh of the Creek Nation to keep an eye upon the Seminole Indians. The letter No. 4 Signed by “A. Arbuthnott” appears to have been written by one of those self-styled philanthropists, who have for a long time past contrived to foment a spirit of discord among the Indians of our country, and destroy them with pretended kindness. Should you be pleased to order me to visit the Seminoles, to wrest from them the murderers of our own offending women and babes; I beg you will authorize my passage by water to the mouth of Appalachicola or to Oklokne Sound, where I can disembark, and in course of a few days afterwards see their warriors, or destroy their habitations. A battalion or two of mounted men from Georgia or Tennessee can be ordered to meet me in Seminole towns. I shall this day write to Major General Jackson upon this subject, but as we have only a monthly mail from this place to Tennessee, it is not likely that he will get my letter as soon as this may reach you. My Qr Mr Department is without funds and nearly without forage—nor is there in this country any means of obtaining transportation for a Regiment; the scarcity of corn having put it out of the power of the inhabitants to keep their teams fit for service. 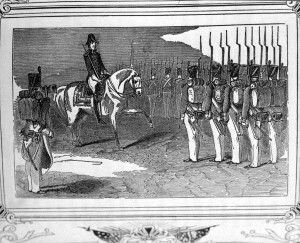 A response from General Jackson’s adjutant can be found as an enclosure in the adjutant letters the next year, 1818, G74 Enclosure 2. From J.M. Glassell, A.D. Camp, to General E.P. Gaines. Your communications of the 2d & 6th Inst. By Lieut Crupper, with their several enclosures, was handed to Major Genl Jackson on yesterday evening. On the subject of the outrages committed by the Seminoles on the Georgia frontier, I had the honor to be the medium of the Generals views to you on the 2d ult. which you will have received in this. He is now more fully convinced of the necessity and directs that you immediately demand the delivery of the murderers holding yourself in readiness and in the event of their non-compliance to take such vengeance as will completely sate the thirst which that nation has for the blood of our citizens.—the mode and route is left to your discretion, and the means being at your disposal, it is expected that the perpetrators of those recent outrages will be promptly brought to condign punishment, and safety ensure to our frontier. The instructions given to Lieut. Gray for his government in passing Pensacola are approved by the Major General, as also the precautions you have taken with regard to the defense of Fort Gaines.